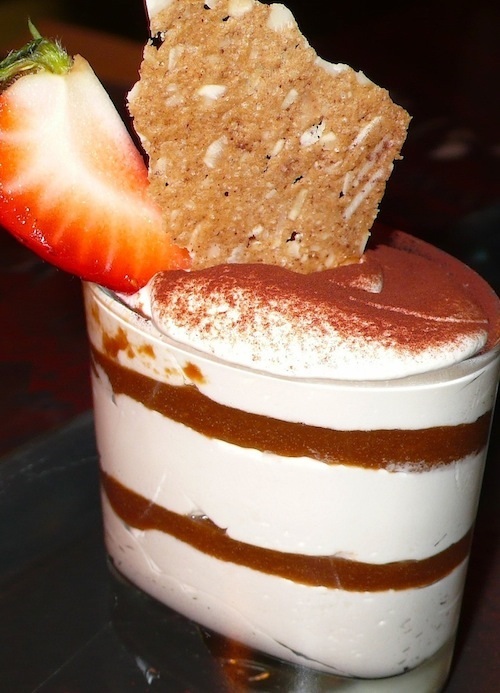 ABOARD THE CARNIVAL MAGIC – No wonder I love tiramisu. I knew it had coffee, alcohol and ladyfinger cookies in its delicious blend. But until I attended a cooking class aboard the Carnival Magic, I wasn’t sure of the other ingredients. Every one of them is yummy. After watching the instructor and tasting the scrumptious results, I’m going to try to the recipe when I get home. Might be dangerous now that I know how to make it. Here is the recipe shared by Carnival Magic chefs and some little tips on how to make it. First off, our cooking class leader Wes said that tiramisu is not something to whip up in a hurry. Although it isn’t difficult to make, he said, it is necessary that some of the steps in the recipe have time to be refrigerated for the best consistency. So, for best results, don’t plan to make it right before dinner and expect to serve it an hour later. “I would make the mix beforehand and refrigerate it overnight to get it into the right mousse-like texture,” he said. Another very important tip, Wes said, is that the filling ingredients must be cooked in a double boiler. When you are ready to assemble the tiramisu, Wes suggested using clear glass containers for visual appeal. Whisk heavy cream until it forms soft peaks. Refrigerate until use. Cream yolks and sugar until smooth. Add in cream over a double boiler whisking constantly until coating consistency to make a sabayon (French name for light mousse-like sauce). Cream mascarpone cheese until smooth and fold into sabayon. Gently fold Grand Marnier, Marsala and whipped cream into the sabayon and refrigerate until the mixture sets. For syrup, dissolve instant coffee in hot water, mix sugar, Kahlua and refrigerate to chill. Soak ladyfinger cookies in coffee syrup and arrange in three alternating layers of cookies and sabayon mixture in tiramisu dish. Serve garnished with chocolate powder. Slip a strawberry slice on the top of the dish and put a slender piece of biscotti in the mixture. Serves four.